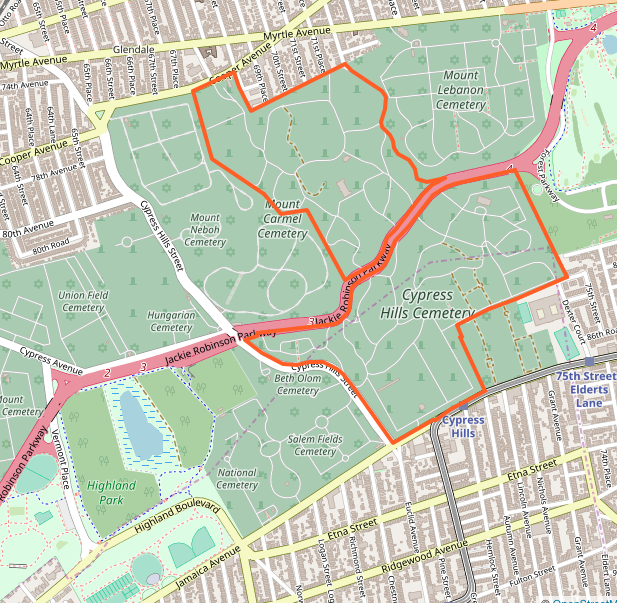 Beginning in the 1850s, a number of Jewish organizations began to acquire large tracts of land along Fresh Pond Road and Cypress Hills Road in Queens to create what would become four cemeteries situated on present-day Cypress Hills Street and Cypress Avenue in the Glendale-Ridgewood area. 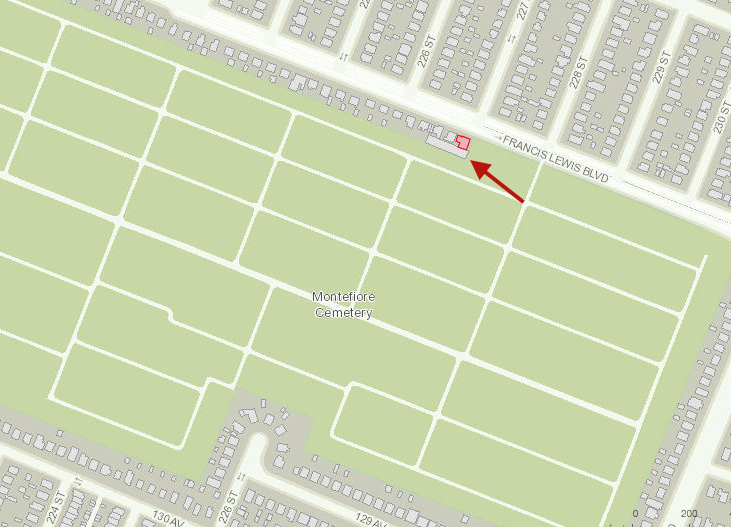 Jointly, these cemeteries—Machpelah Cemetery, Union Field Cemetery, New Union Field Cemetery, and Hungarian Union Field Cemetery—now cover about 60 acres where over 60,000 individuals have been interred. 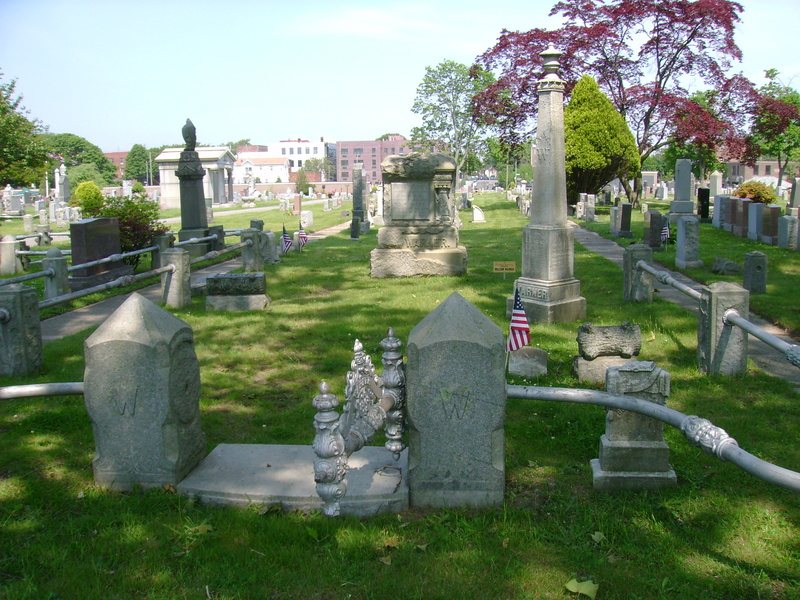 Although each of these cemeteries has its own entrance and is separately owned today, early in their history they were managed cooperatively by Machpelah Cemetery Association. 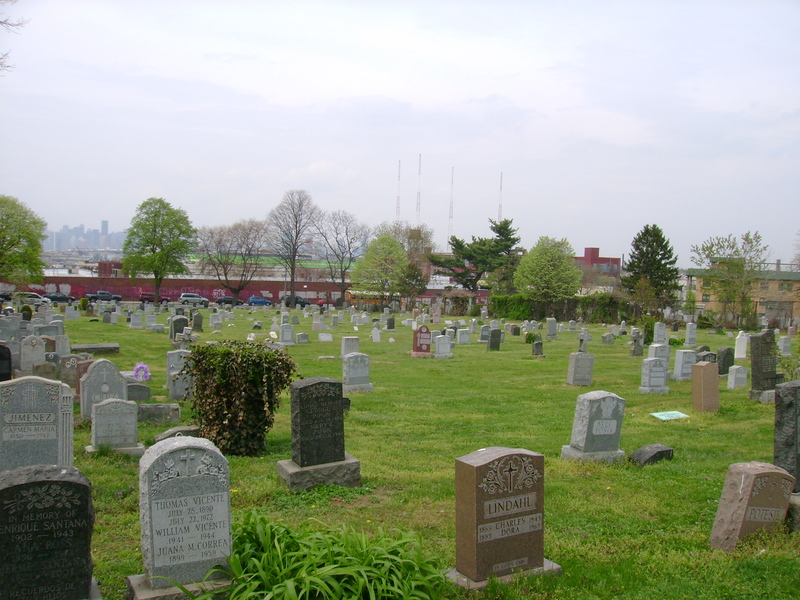 This shared history can be seen in the fact that there are no fences separating the cemeteries from one another—the grounds run together and a visitor entering the gate of one cemetery may wander down a path and suddenly find him or herself in one of the adjoining cemeteries without realizing it. 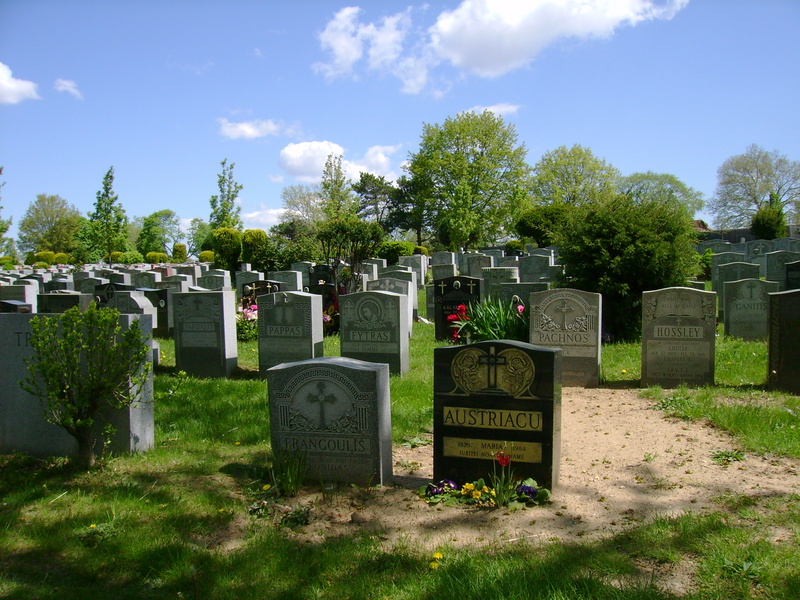 The communal nature of the four cemeteries has frequently led to mix-ups in burial records, obituaries, and other accounts regarding which cemetery an individual was actually interred in. 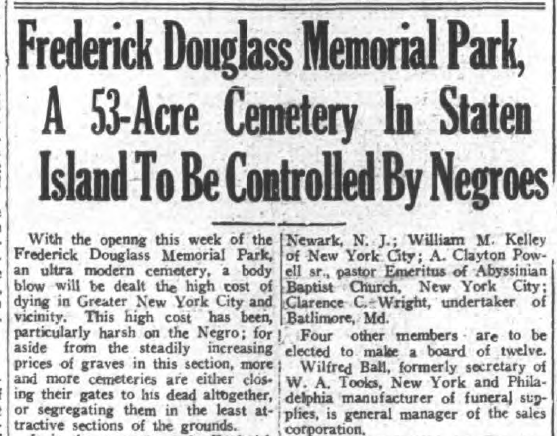 Newspaper reports and property records often confuse the cemeteries and their ownership as well. 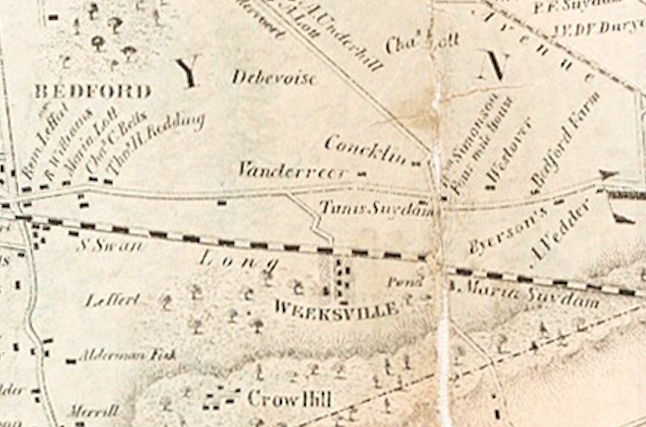 An 1881 cemetery guide describes Machpelah Cemetery, which was established around 1855, as “a Jewish burial place of age and renown,” located “on high, sandy ground, that is well wooded and shaded,” “a handsome place and well laid out, and well cared for.” By the late 1980s, the cemetery had been abandoned to the state because its board had run out of money and its grounds had become a neglected “impassable jungle.” Today the six-acre cemetery is administered by David Jacobson, who operates several of the city’s smaller Jewish burial grounds, and is well kept though timeworn and frequently deserted—burials are now rare at Machpelah Cemetery. Machpelah’s imposing 1928 entrance building on Cypress Hills Street deteriorated with the cemetery’s decline, its offices ransacked and the cemetery’s records scattered around the inside, and was demolished in 2013. 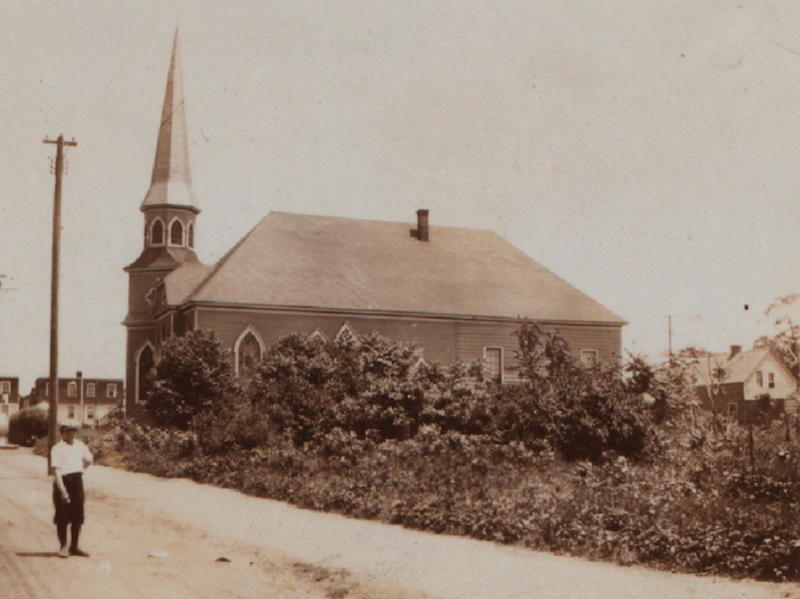 Machpelah is distinguished as the burial place of master magician Harry Houdini (Erich Weiss). Since his death on October 31, 1926, thousands of magicians and fans have made the pilgrimage to Houdini’s gravesite at Machpelah where the Society of American Magicians and the Houdini Museum hold memorial services for the famed escape artist and help care for his grave. 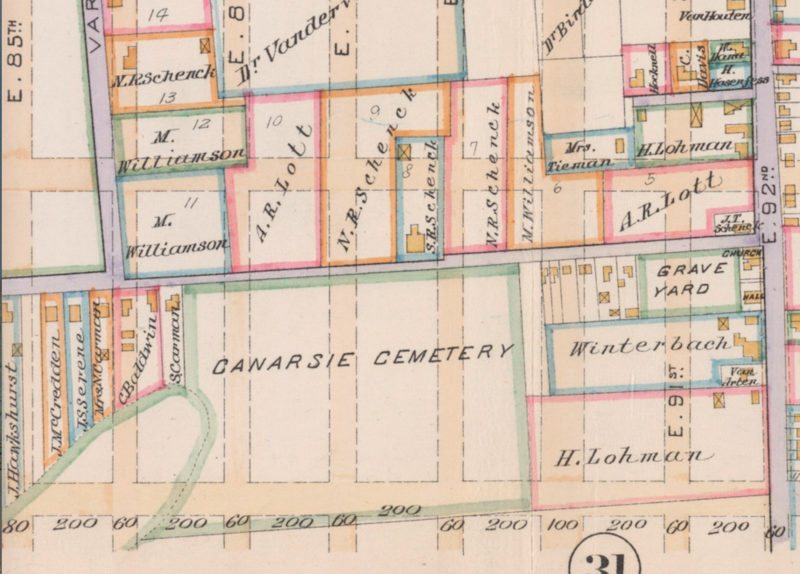 North of Machpelah Cemetery on Cypress Hills Street is the 10-acre New Union Field Cemetery, which was established around 1875 by Manhattan’s Temple Beth-El, one of New York’s wealthiest Jewish congregations at that time. 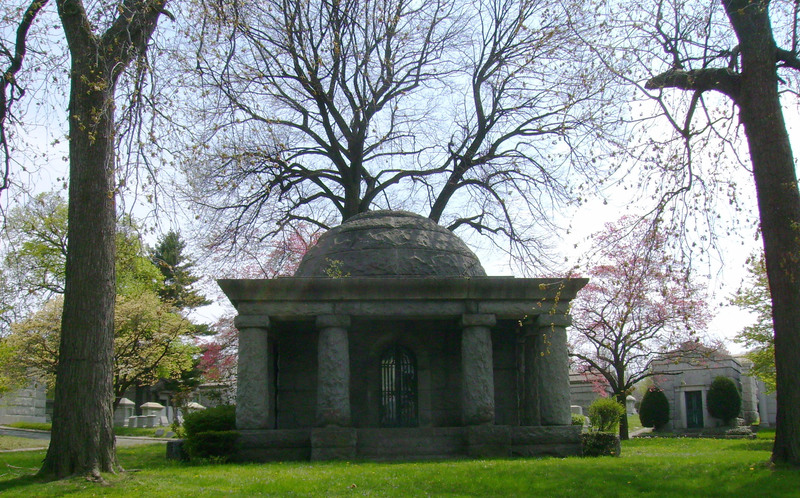 In 1893 they erected the cemetery’s grand entrance building at a cost of $20,000; designed by architect Louis Korn, the two-story stone structure is 60 feet wide by 30 feet deep and was designed to accommodate a receiving vault, offices, and keeper’s apartment. 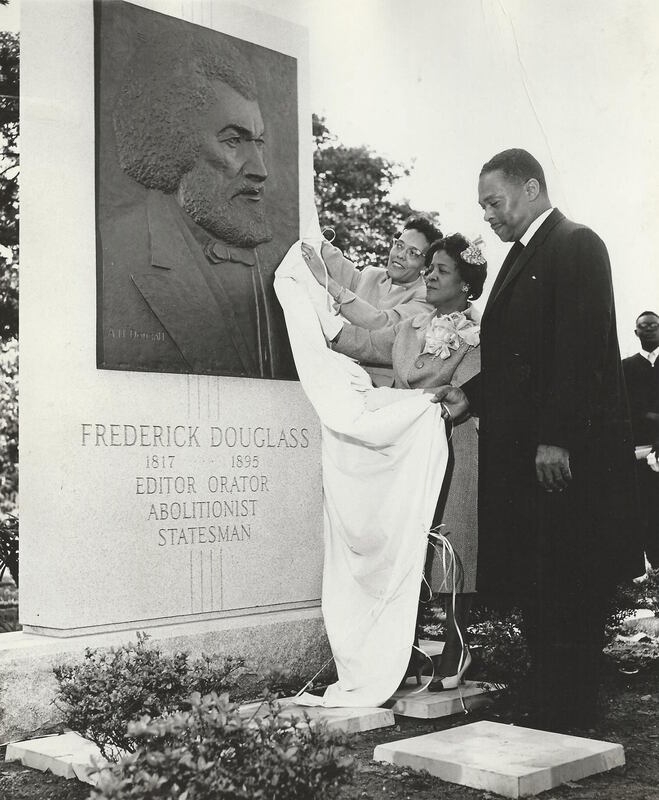 New Union Field Cemetery is the final resting place of actor Edward G. Robinson and was the original burial place of businessman Isidor Straus, the co-owner of Macy’s department store who perished with his wife on the Titantic in April 1912 (he was later moved to Woodlawn Cemetery in the Bronx). 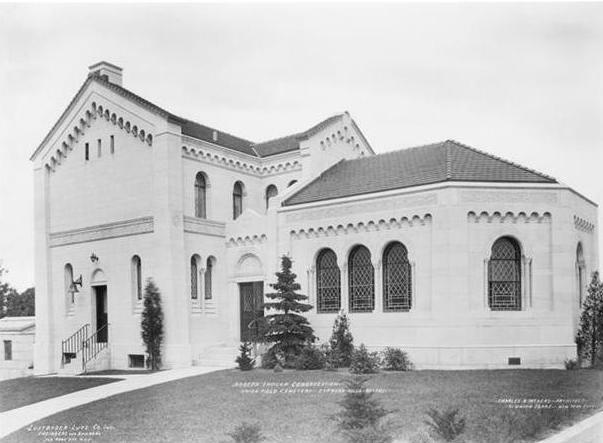 In 1928 Temple Beth-El merged with Manhattan’s Congregation Emanu-El; Congregation Emanu-El operates New Union Field today as Beth-El Cemetery. Nowadays, Beth-El Cemetery primarily caters to the city’s Jewish community from the former Soviet Union, and in 2005 opened a Russian Community Memorial Garden that pays tribute to Jewish Russian war veterans, their families and loved ones lost during World War II. At the center of the garden is a monument representing the Star of David, topped with an obelisk and a sculpture of an eternal flame. The memorial provides the estimated 300,000 Russian Jews living in New York City with a place to gather and remember their loved ones. 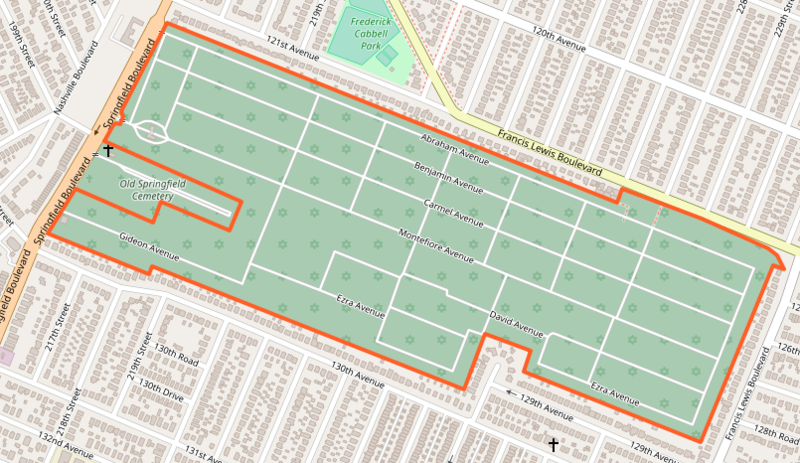 To the rear of Machpelah and New Union Field is Union Field Cemetery, a 35-acre, irregular L-shaped swathe that stretches from its entrance on Cypress Avenue to its northern boundary along 59th Street near 80th Avenue. 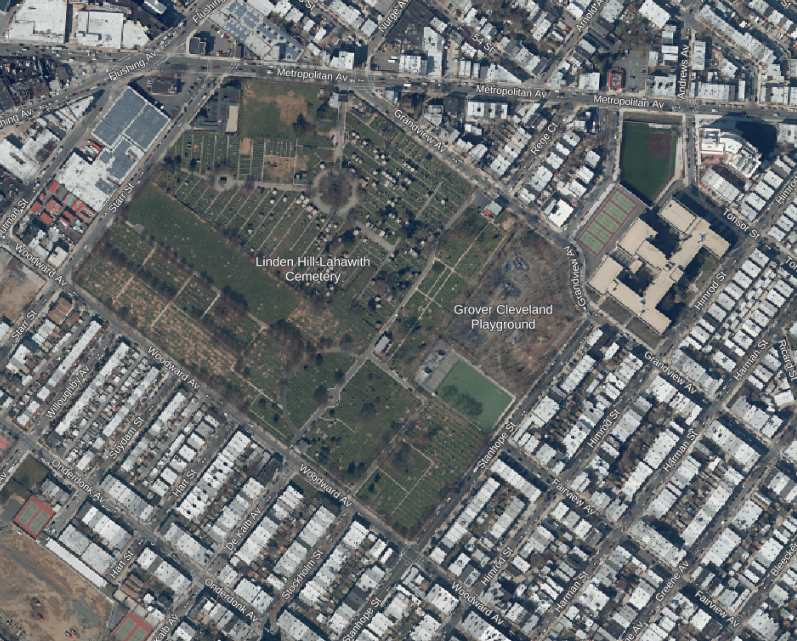 Manhattan’s Congregation Rodeph Sholom established Union Field around 1855 and expanded it in 1878. 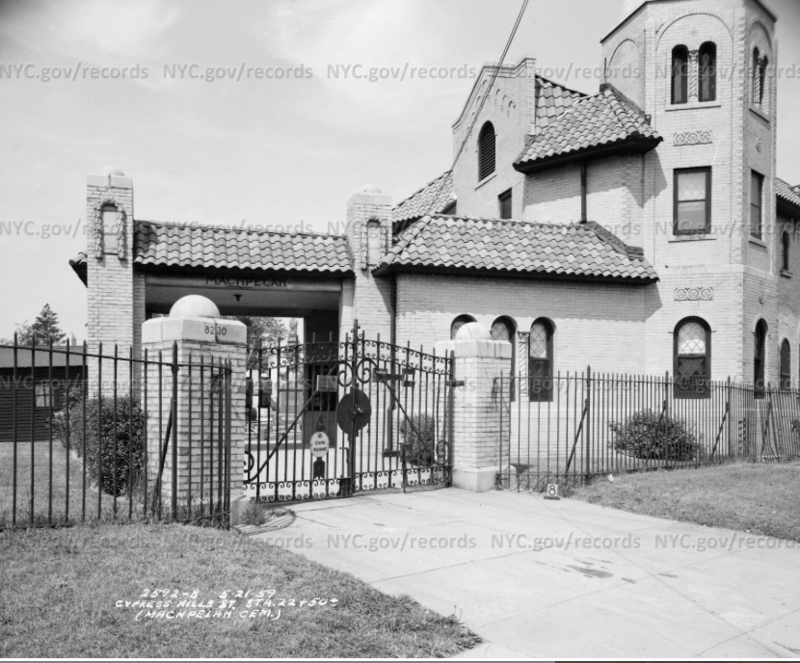 Concurrent with the Congregation’s move to its present location on West 83rd Street in 1926, they erected the gatehouse designed by architect Charles B. Meyers that stands at the Cypress Avenue entrance. Union Field is the location of a number of kivrei tzaddikim, “graves of the righteous,” and is a pilgrimage site for many Orthodox Jews. 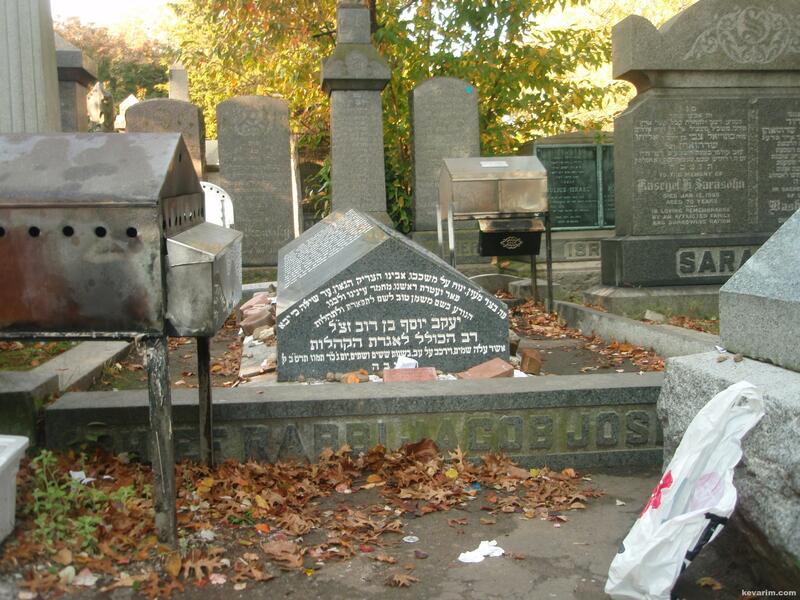 One of the most important graves here is that of Rabbi Jacob Joseph, the first and only chief rabbi of New York. Rabbi Joseph was brought to New York from Europe in 1888 by a group of 17 Orthodox synagogues; he served for only a short time before dying of a stroke in 1902. 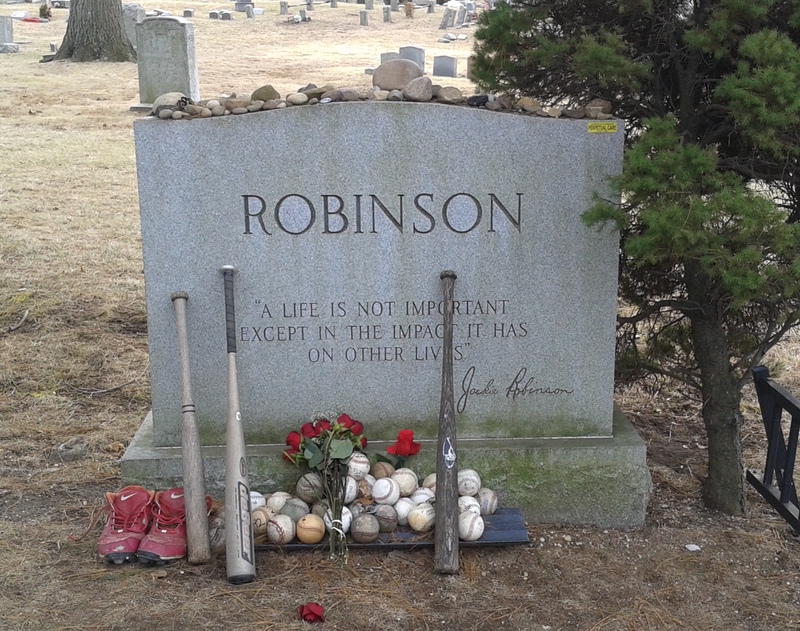 Thousands visit his gravesite each year, including Hassidic rabbis and their congregants and Talmudical teachers and their students, to light candles and offer prayers around his tombstone. Among the less holy notable figures interred at Union Field Cemetery are actor Bert Lahr, best known for his role as the Cowardly Lion in the Wizard of Oz, and controversial attorney Roy Cohn, who rose to fame as Senator Joseph McCarthy’s chief counsel during the 1950s Communist investigations. 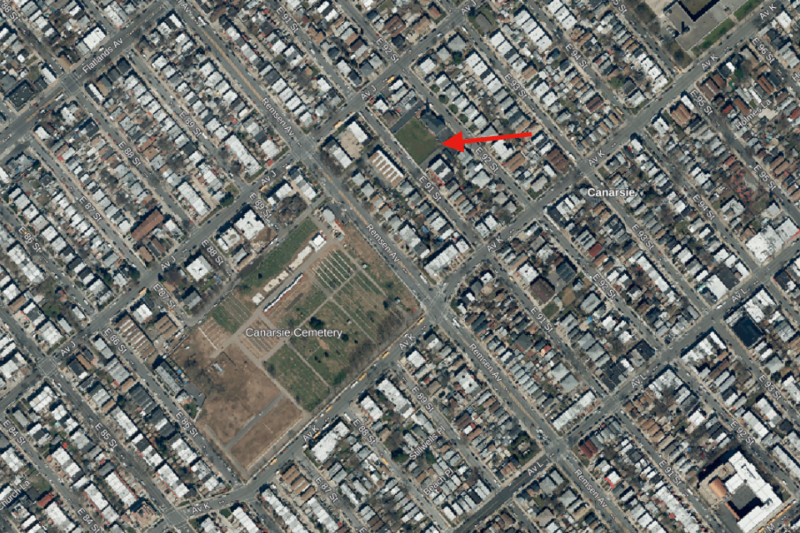 In 1903, the First Hungarian Sick and Benevolent Society purchased a two-acre parcel of land just east of Union Field Cemetery that became known as Hungarian Union Field Cemetery. 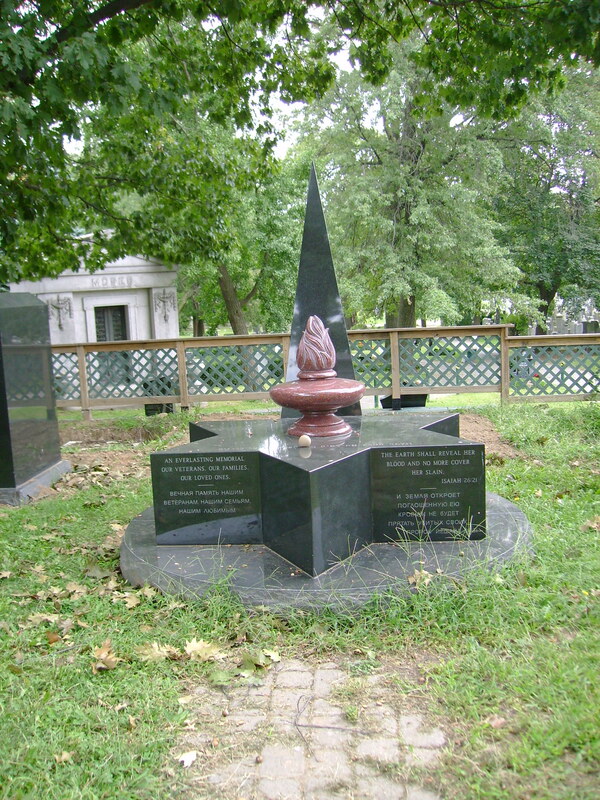 Besides obtaining burial grounds, the society, which was later called the Hungarian Society of New York, was founded for “mutual self-protection, philanthropy, the fostering of patriotism and the furtherance of humanitarianism.” The Hungarian Society eventually acquired an additional four acres so that the grounds of Hungarian Union Field Cemetery came to fill the area between Machpelah and Union Fields at the corner of Cypress Hills Street and Cypress Avenue. 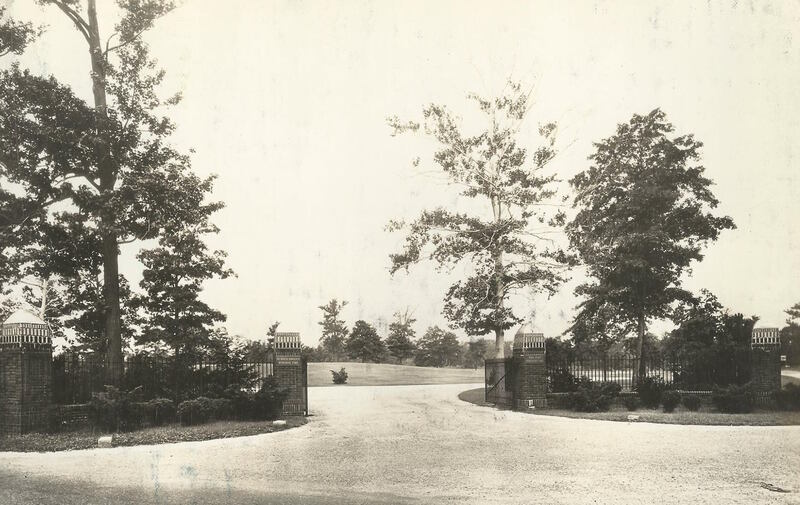 In 1937, the society constructed a large stone building on the cemetery grounds to house their offices. 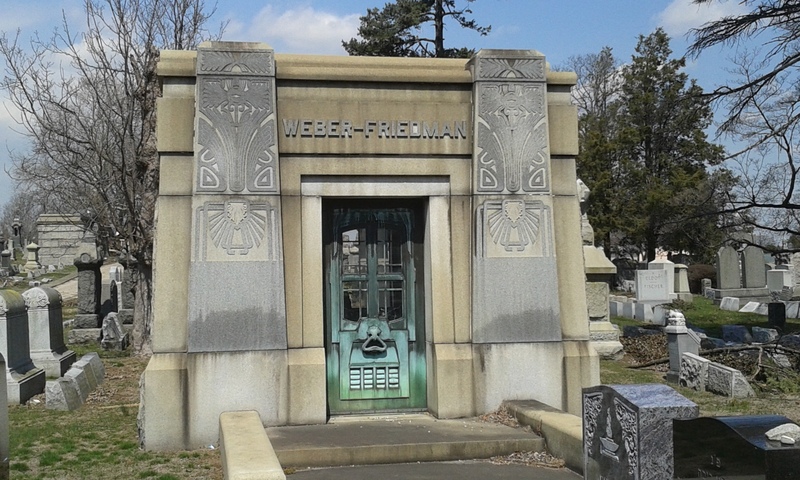 Joe Weber, a vaudevillian who, along with Lew Fields, formed the comedy team of Weber and Fields that was popular at the turn of the 20th century, is among the prominent individuals interred at Hungarian Union Field Cemetery; his remains were placed in the Weber-Friedman mausoleum near the cemetery’s entrance when he died in 1942. 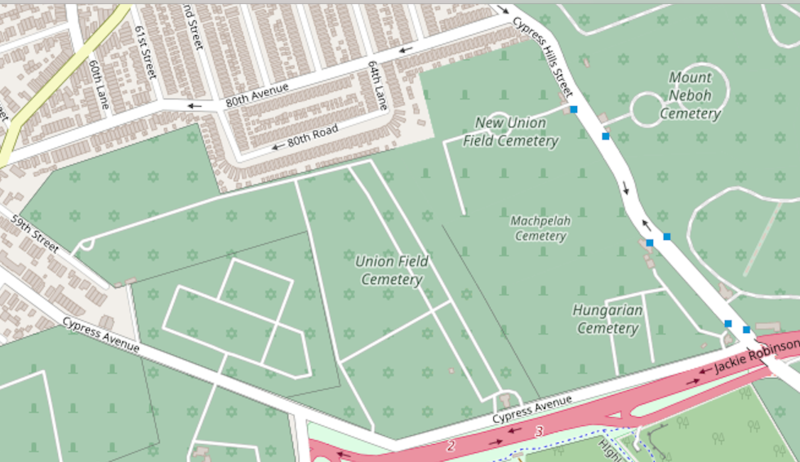 In recent years the Hungarian Union Field Cemetery was acquired by Mount Carmel Cemetery, the large Jewish cemetery located opposite it on Cypress Hills Street, and is now a division of Mount Carmel. 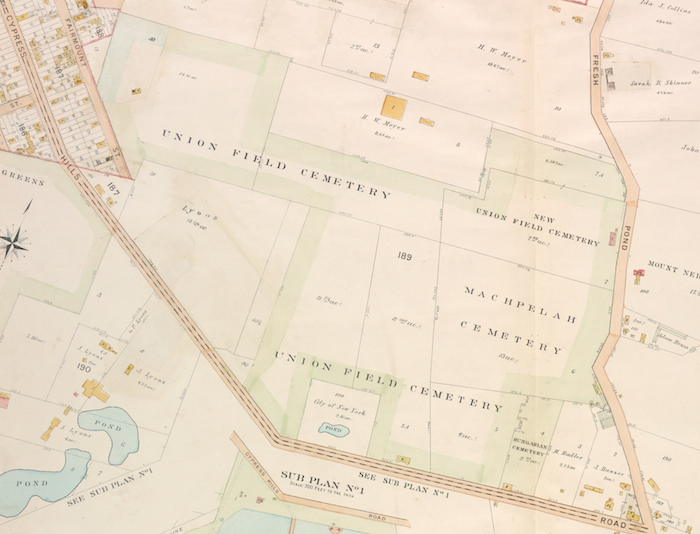 Sources: Hyde’s 1913 Atlas of the Borough of Queens Vol 2, Pl 19; The Cemeteries of New York (Judson 1881), 13; The Leonard Manual of the Cemeteries of New York and Vicinity (1901), 51, 63, 90-91; Fairchild Cemetery Manual (1910), 86, 106-107, 165, 167; “Our Public Cemeteries,” New York Herald, Jun 2 1867, 8; “Machpelah Cemetery Association,” Jewish Messenger, Dec 12, 1879, 2; “Thinking Ahead,” New York Times Oct 13, 1996; “Vandals Hit Glendale Cemetery,” Queens Chronicle, July 20, 2000; “Houdini’s Final Trick, a Tidy Grave,” New York Times, Oct 31, 2008; “Among the Cemeteries,” Jewish Messenger, Jun 16, 1893, 2; “The Funeral of Isidor Straus,” American Hebrew & Jewish Messenger, May 10, 1912, 36; The Cemeteries of Emanu-El (Congregation Emanu-El); “Beth-El Cemetery Opens New Russian-Jewish Memorial,” YourNabe.com, May 26, 2005; “Dedication of a Burial Ground,” Jewish Messenger, Sep 6, 1878, 2; “Graves of the Righteous,” Jewish Action, Fall 2010, 50-54; “Thousands Attend Gravesite of Rabbi Yaakov Joseph,” Vos Iz Neias, July 16, 2009; “First Hungarian Sick and Benevolent Society in U.S.,” YIVO News, No. 2013 Summer 2007, 21. 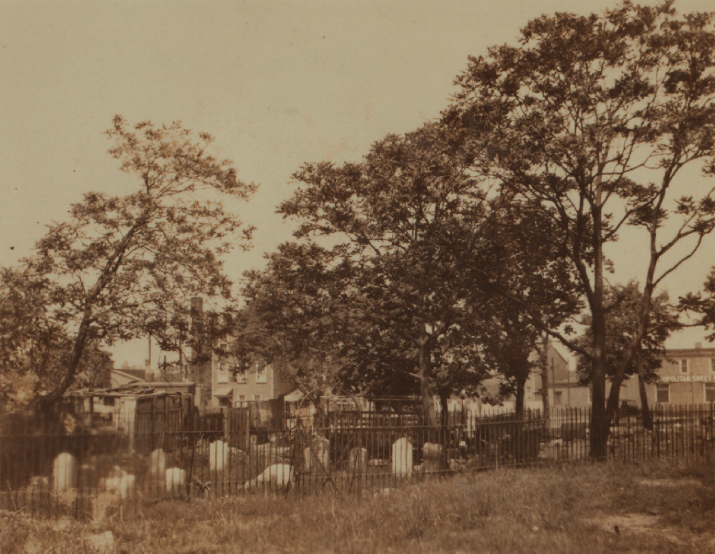 On a hilltop near the intersection of Flushing and Metropolitan Avenues in Ridgewood, Queens, are two small garden-like cemeteries created in the mid-nineteenth century. 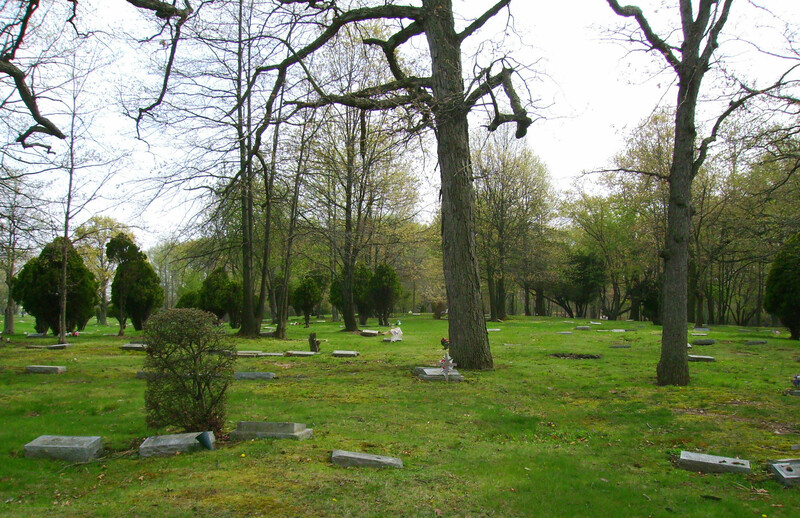 Linden Hill Methodist Cemetery is a 21-acre burial ground situated along Woodward Avenue between Starr and Stanhope streets. Established in 1842 by the Second Street Methodist Episcopal Church in Manhattan, in 1852 the cemetery was acquired by the First German Methodist Episcopal Church of Manhattan who operated it until 1977, when it was transferred to the New York Annual Conference of the United Methodist Church. 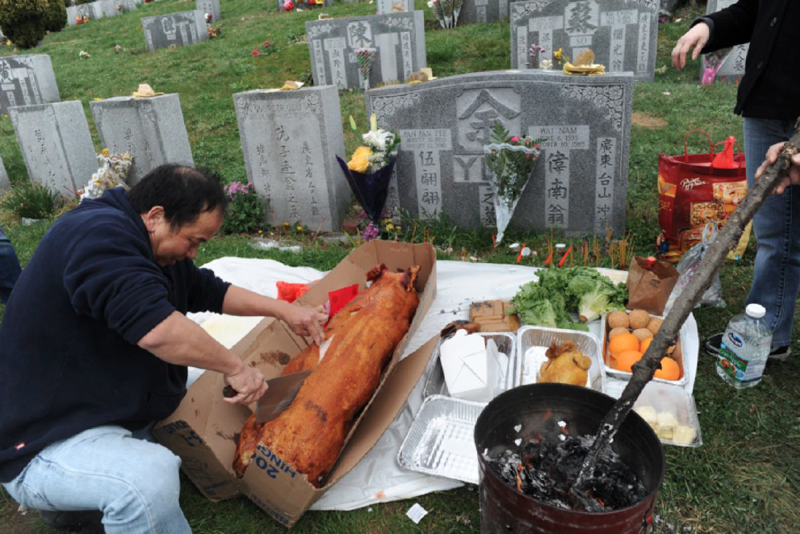 Although owned by Methodist entities throughout its history, Linden Hill Cemetery has always been a nonsectarian, multi-ethnic burial ground. 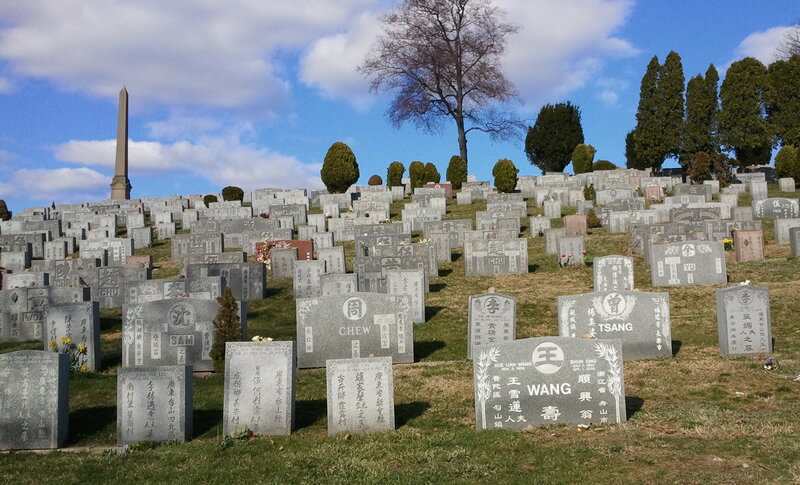 The humble gravestones that fill its grounds mark the final resting place of more than 30,000 people and reflect the area’s shifting demographics—many of the earlier monuments are for German, Italian, and Eastern European immigrants, while more recent graves are predominately Hispanic and African American. 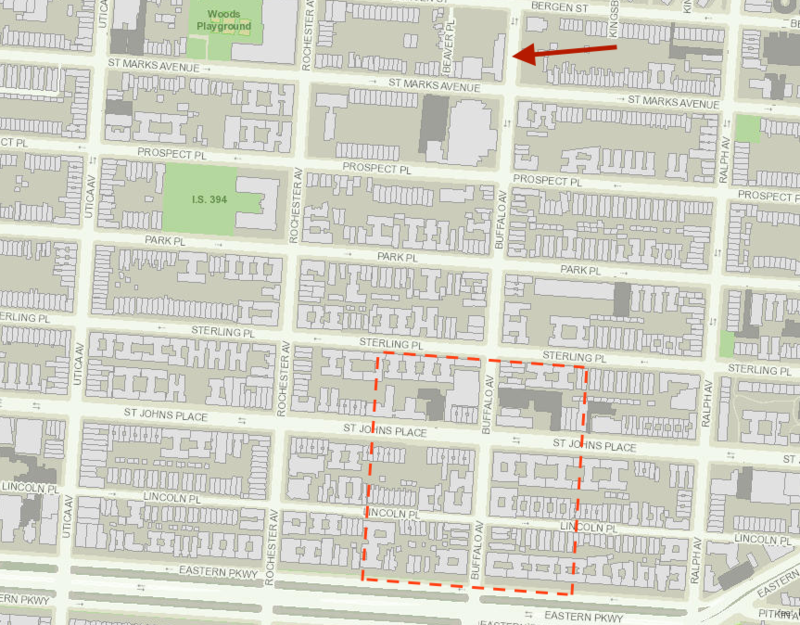 In 1875, Ahawath Chesed, a prosperous German Jewish congregation now known as Central Synagogue and located on Manhattan’s Upper East Side, acquired a tract of land adjacent to Linden Hill Methodist Cemetery for a Jewish burial ground. 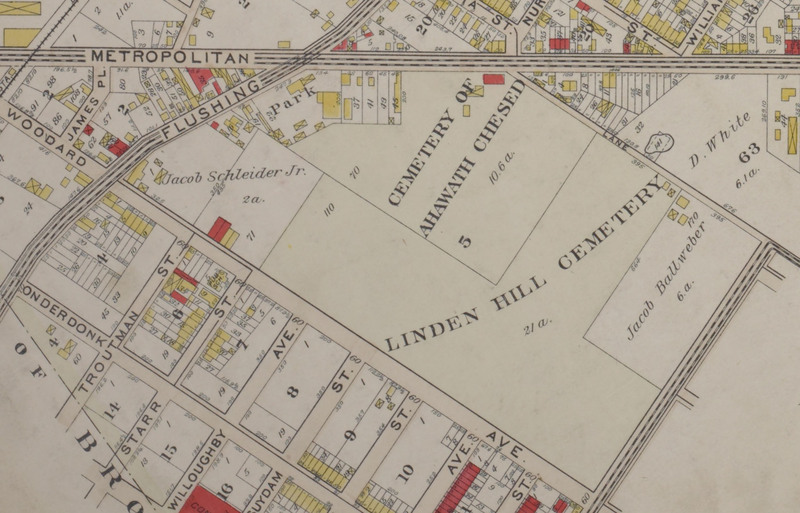 Linden Hill Jewish Cemetery occupies 10 acres on the northwest side of the Methodist cemetery, and has its gatehouse at the corner of Metropolitan Avenue and Grandview Avenue. 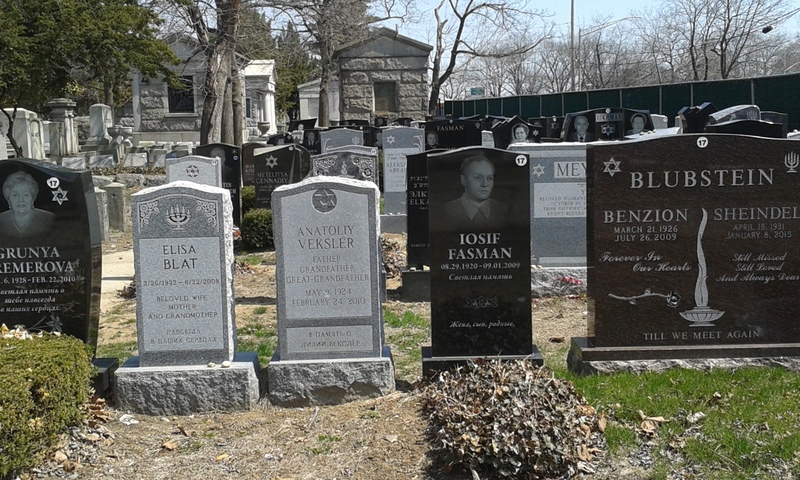 A number of prominent members of New York’s Jewish community lie buried beneath monuments and in mausoleums here, including U.S. Congressman Jacob Javits and businessman Joseph Bloomingdale. 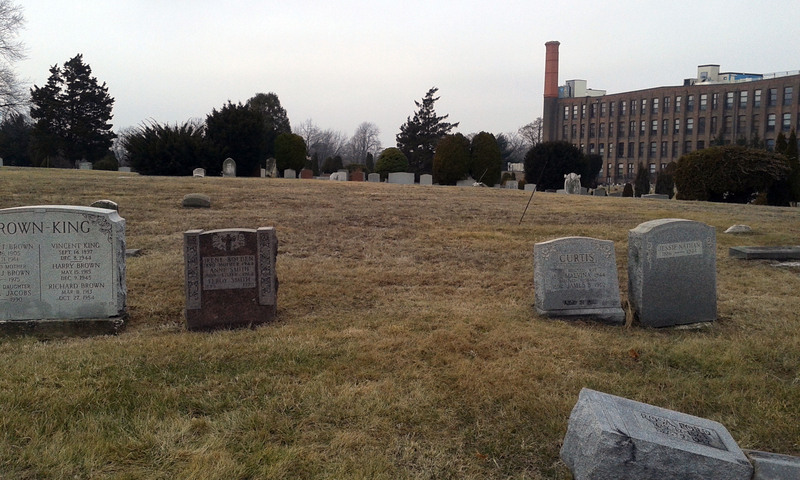 In 2008, Central Synagogue sold Linden Hill Jewish Cemetery to David Jacobson, who operates several of the city’s Jewish burial grounds, and today the cemetery primarily is used by recent Jewish immigrants from the former Soviet Union. 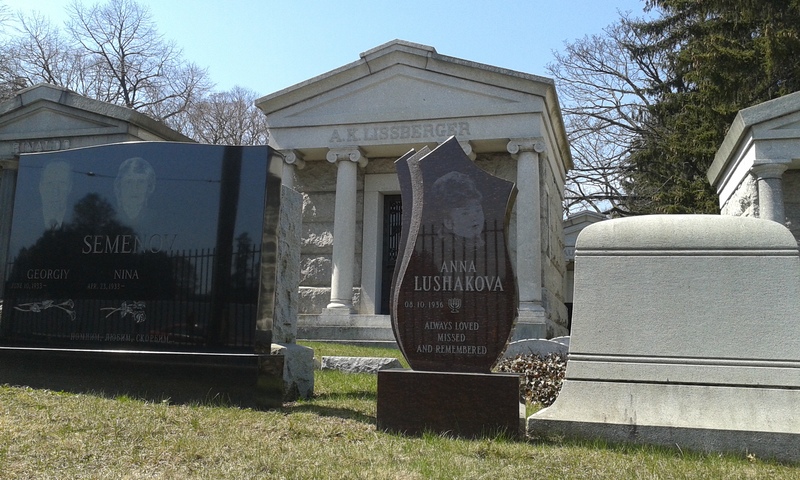 Among the notable individuals interred at Linden Hill Jewish Cemetery is theatrical producer and playwright David Belasco, whose family mausoleum occupies a central position at the end of the cemetery’s entrance drive. Designed by Tiffany Studios, the domed structure is of heavy, rough-hewn granite with marble interiors. Belasco built the mausoleum in 1913 in memory of his daughter Augusta, who died three years earlier at age 22. During her life, it was said, Augusta Belasco dreaded the dark; when she was interred in the mausoleum David Belasco and his wife installed a bronze lamp that was kept burning day and night to insure “that beside their dead daughter there shall be kept an eternal vigil of light.” David Belasco was interred next to his wife and daughter in the mausoleum when he died in 1931. 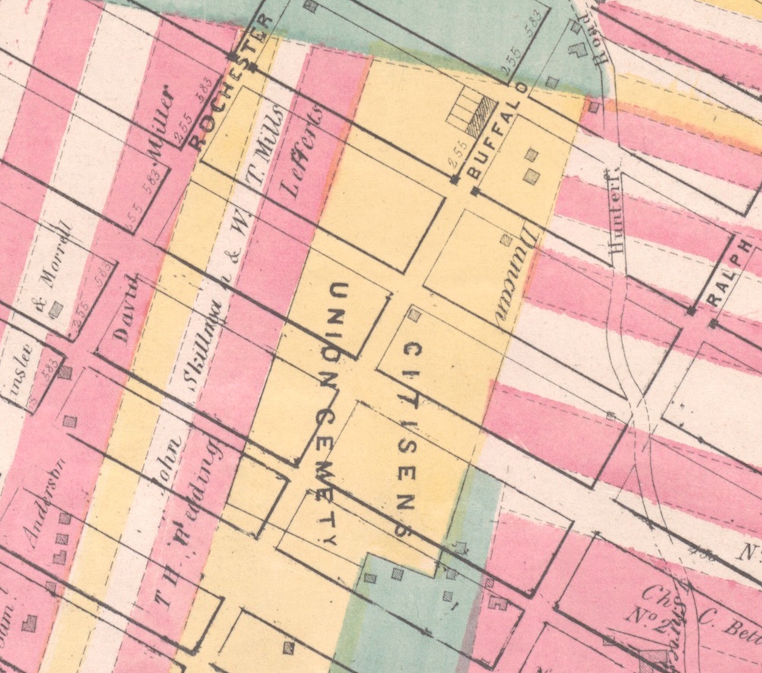 Sources: Bromley’s 1909 Atlas of the City of New York, Borough of Queens Pl 17; Linden Hill United Methodist Cemetery; The Cemeteries of New York (Judson 1881), 18; The Leonard Manual of the Cemeteries of New York and Vicinity (1901), 9, 50; Central Synagogue Archivist, personal communication, April 27, 2016; “Playwright’s Mausoleum,” The Reporter Oct 1914, 35; “Stars of Stage Pay Tribute to David Belasco,” Schenectady Gazette May 16, 1931, 14; Beyond Grief: Sculpture and Wonder in the Gilded Age Cemetery (Mills 2014), 182. 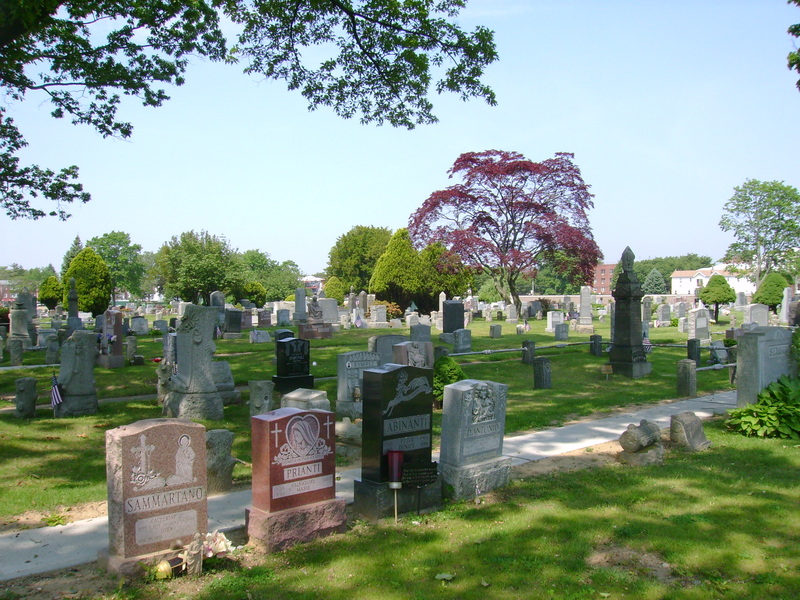 One of the city’s largest Jewish burial grounds is Montefiore Cemetery, located in far southeastern Queens near the edge of the New York City limits. 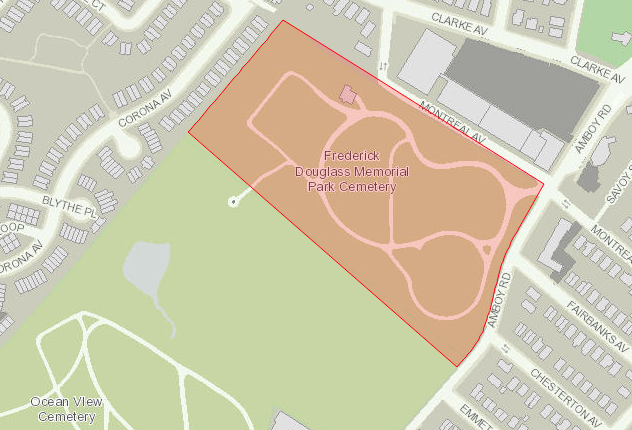 This 114-acre site is situated on flat land along Springfield Boulevard and Francis Lewis Boulevard in Cambria Heights, an area that held a thriving Jewish population during the first half of the 20th century, and surrounds the non-sectarian, 5.5-acre colonial-era Old Springfield Cemetery on Springfield Boulevard. 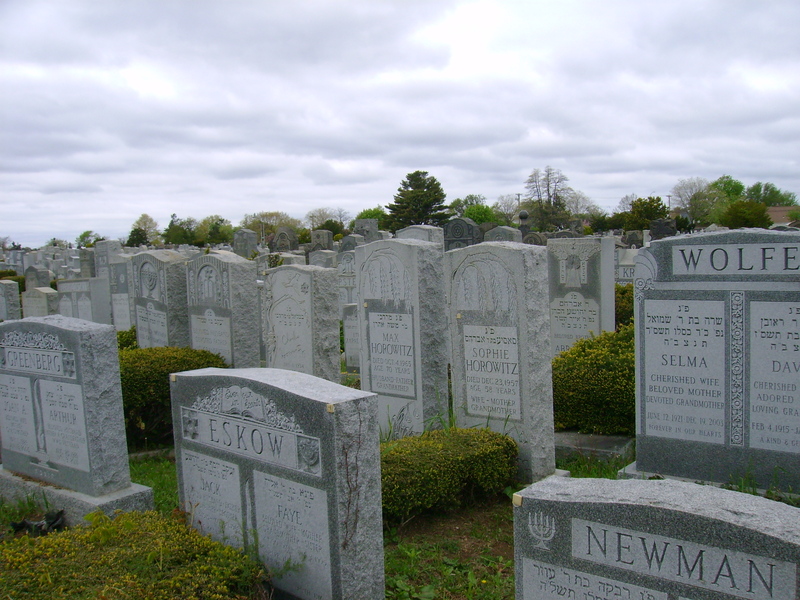 Montefiore Cemetery has been serving the Jewish community of the New York City area since 1908, and hundreds of societies, congregations, lodges, and temples own sections here. Montefiore is the final resting place of more than 158,000 individuals, mostly ordinary men and women who are remembered with modest monuments that hint at life stories or personalities.“When we fell in love it was forever,” proclaims the inscription on one couple’s tombstone, while the numerous stones placed atop the marker of an “Adoring Grandmother / Beautiful Soul” attest to frequent visits and devotion of her family and friends. 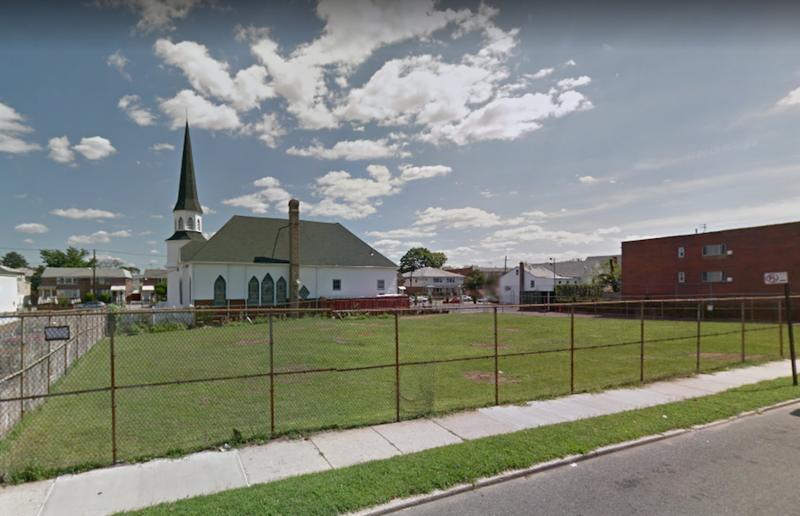 A number of famous—and infamous—figures are also buried here, including abstract expressionist painter Barnett Newman, songwriter Sholom Secunda, actor Fyvush Finkel, and Prohibition-era mobsters Jacob Shapiro and the Amberg brothers, Hyman, Joseph and Louis. Prizefighter Al “Bummy” Davis (Albert Davidoff), who was killed resisting a Brooklyn bar robbery in 1945, is also here, as is Arnold Schuster, a 24-year-old clothing salesman who provided a tip that led to the capture of bank robber Willie Sutton in 1952 and was murdered a few weeks later, allegedly at the order of mob boss Albert Anastasia. Most notably there is also the grave of Rabbi Menachem Mendel Schneerson, the seventh—and last—leader of the Chabad-Lubavitch Hasidic dynasty based in Crown Heights, Brooklyn. Known universally as “the Rebbe” and considered one of the most influential Jewish leaders of the 20th century, Rabbi Schneerson died at age 92 in 1994. Every year, tens of thousands of Jews from around the world, many of whom claim Schneerson as the messiah, visit his gravesite. Following the belief that part of the soul of a righteous Jew who has died remains at the grave, when people visit they experience it as though they are in the presence of the holy man himself. When the Rebbe was of this world, people would visit him and write to him to ask for his blessing and advice. 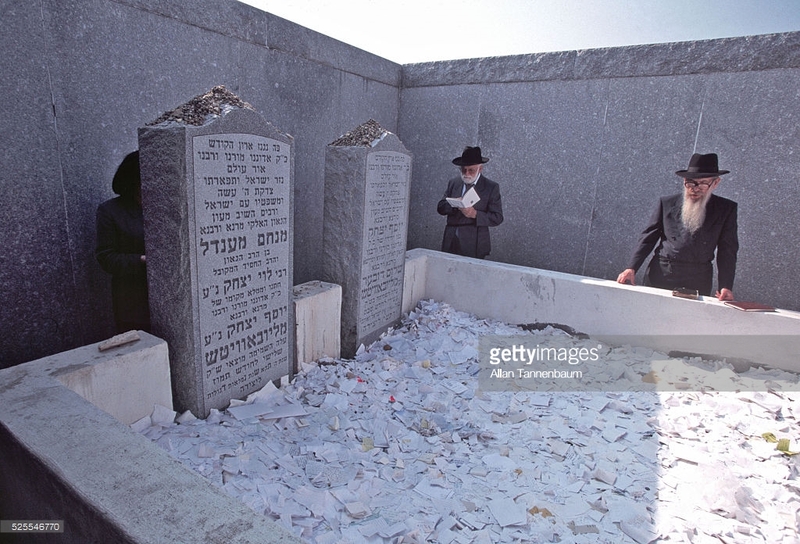 Now people visit the site where he is buried and leave little notes to ask for his blessing, informing him of recent activities, and asking questions—certain that the Rebbe will find a way to answer them. 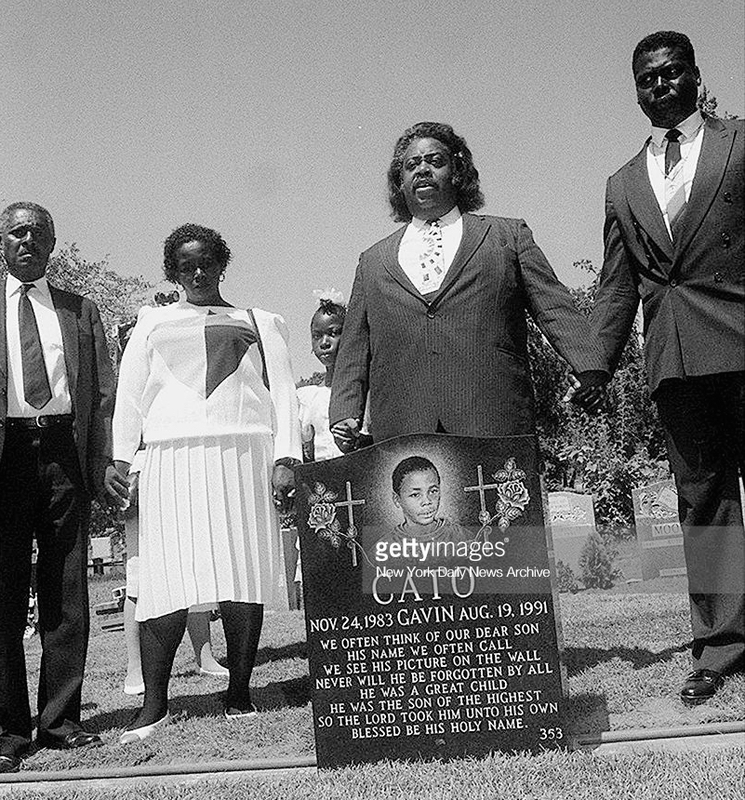 The notes are read at graveside, torn into four parts, and left on the ground in front of the grave. 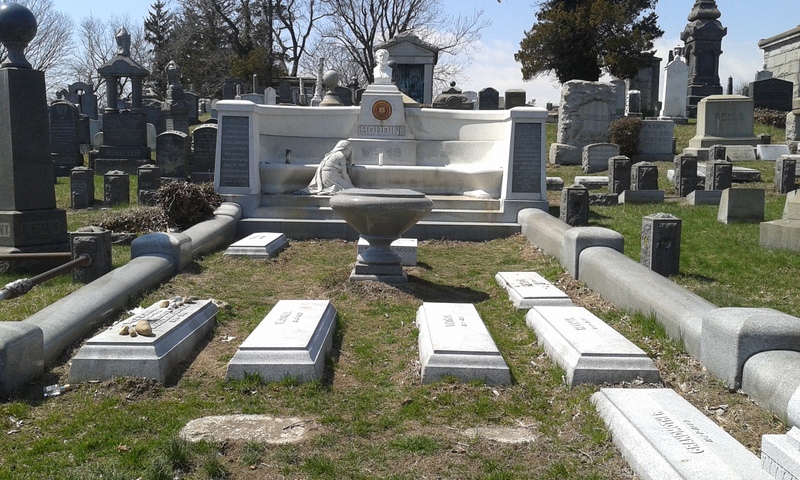 Rabbi Schneerson’s grave is located in the northeastern section of Montefiore Cemetery where it borders Francis Lewis Boulevard. 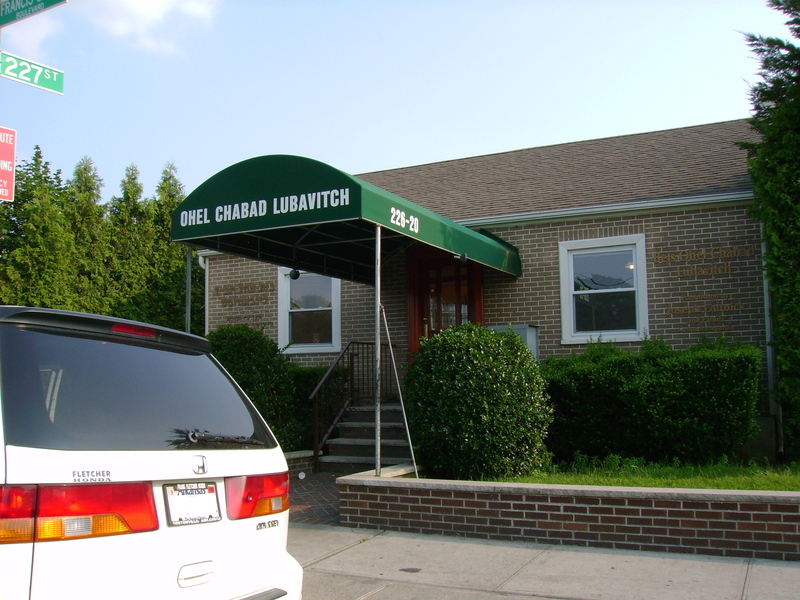 Shortly after the Rebbe’s death, Chabad Lubavitch purchased a house adjoining his gravesite. 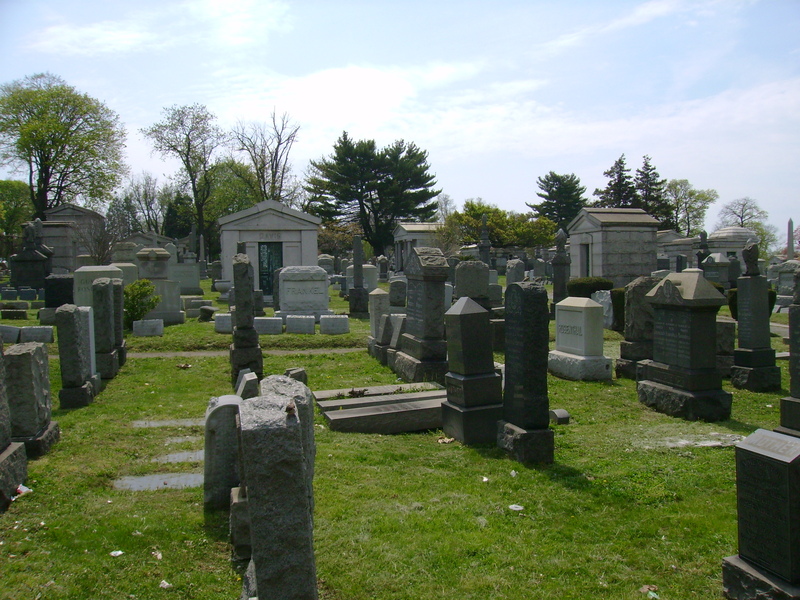 The site is known as the Ohel, and refers to the structure built around the resting place; the house abutting the cemetery is the Ohel Chabad Lubavitch Center, and offers access to the gravesite via a private walkway. Open day and night, all year, the Rebbe’s resting place has become a pilgrimage site for the ultra-Orthodox Lubavitchers, as well as for secular Jews and Gentiles who are drawn to the mystical passion surrounding the Rebbe. More than 50,000 people visited the site to commemorate the 20th anniversary of the Rebbe’s death in 2014.